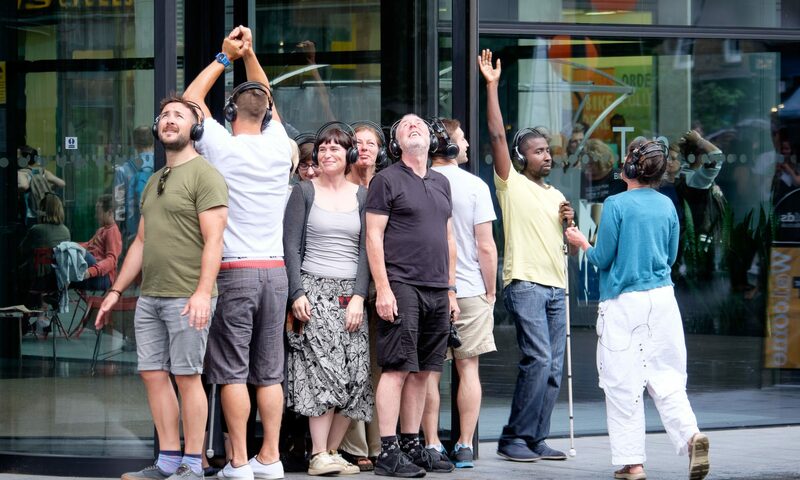 It’s a tremendous privilege to ‘know’, and experience ‘meeting’ another person through sound art. I had such an experience last week in Norway where I sang with a young singer Tine, and a musician/composer called Jon from Signo a centre for deafblind people. Unable to communicate through words or signs as neither of us spoke the same language, Tine offered me a wide palate of vocal sounds that grew and expanded there and then between us. This was an example of finding, allowing, making, remaking as well as shifting the platform of support between us, done moment by moment in creative dialogue with each other; responding as it worked or even teetered on the edge. This was a performance full of complexity, even virtuosity and it was nearly 45 minutes long, but most of all it was both beautiful and a journey into the unknown, where shared senses of loss and wonder met through this world of sound. I have never experienced the like – we gave and received, as mutual appreciation healed us. Was this therapy for me? for her? or was it art? I’m sure the music we produced was worthy of an audience, but we had no audience to speak of, only this acute sense of listening to one another and Jon there too joining in as both witness and participating musician. It worries me though, that when presented with a ‘show’ to deliver, us artists can easily fall back on impositional ways of producing the work, marshaling the sounds and movements of others, or over tidying up their canvasses. Perhaps it’s to remove the fear of failure or is it because we aim for an ‘aesthetic’? One thing I know for sure is that the alternative is in a very different register. What follows is a beautiful piece of writing from Tony Baker which he generously wrote for me 4 years ago, at a time when I felt salamanda tandem was profoundly misunderstood and the company’s future was threatened. Here, Tony grasps the nettle on the question of aesthetics. When you voiced your anxieties about recent misunderstandings of your work at our French concert, I suppose in some ways I wasn’t surprised. While I’ve always known you as the most dedicated and scrupulous professional, I’ve always known too that your methods – or I should maybe call them your ‘politics’, as in this context I see the two as integral – were necessarily open to misunderstanding. And I mean ‘necessarily’. If the politics are to have meaning, I think the risk is necessary to what you’re doing, and have been doing for more than 20 years. But that can’t make misunderstandings any easier to deal with. Back in – when was it, 2003? – we did a week’s work in Tamworth with a group of young people with disabilities. I think there were five days of workshops, using all sorts of techniques and materials; we made dance, music, diapos… the floor sculptures using those sticks I remember particularly vividly. On the Friday afternoon we made a performance exploiting all these different elements, a sort of Cage-like happening though I know we planned pretty carefully how to prepare the space (including how to exclude, indeed vanish the proscenium arch in the hall! ), and pace the event . At one point in the performance a lass of about 16 got up and danced in the light of a diapo she’d made to music that I made with another of the participants. She was a heavy sort of person, her movements wonderfully and effortlessly ungraceful in the classical sense. It was all profoundly natural. The sort of thing actually that Régine Chopinot, whose words I’ve been translating recently and who’s something of an enfant terrible in French dance, works hours to get from the best contemporary dancers in this country. After our performance, which was attended by, I think, 2 people other than those directly concerned with the workshops, I was talking with someone, a parent or a social assistant of some kind, I forget now which, and she was both bewildered and delighted. Never before had anyone known this girl to want to dance before. And on this occasion the girl seemed to enter the space and dance utterly without misgivings, as if she’d always been doing it. Now I do, currently, around 50 gigs of one sort or another a year, and am lucky enough to work with a number of terrifically good musicians and artists, but I don’t think any performance I’ve ever done has been better than that in Tamworth. Of course, every gig’s different and none really comparable, but the point is that I’d have been glad to present that Tamworth performance to any public in any place for I know by any appropriate standards it was good. I’ll bet Régine, who’s just finished an enthusiastically reviewed show at the Beaubourg in Paris, would have been inspired and figuring there and then how to use what she’d seen. But this is the difficulty and why I say you’re open to necessary misunderstanding. When I say that gig was good I mean it as a professional musician who struggles with his art, practices it day in day out in the hope of making something as meaningful as I can from whatever skills I have—in the hope of communicating, involving, stirring… moving anyone listening, whether it’s two people or a thousand. I believe none of the very few who were there on that Friday in Tamworth weren’t moved, but here is where the misunderstandings arise. Had there been anyone from the press, or a representative from any body supporting the project, I’m confident the responses would have been enthusiastic; I’m sure they’d have said how extraordinary it was to see such creativity from such a person, indeed such a group. Which would have been totally true. But it would have been only half the story. My approach is aesthetic – learning disabled or no, it was a moving performance on aesthetic grounds. I suspect for anyone from outside it would have been moving because the dancer happened to have a learning disability. And in that distinction – between the aesthetic concerns of the artist inside the work and the often socially-orientated concerns of those who come from outside – is built the whole arena of your methods which I’m calling ‘political’. These are subtle distinctions. If we could have magicked that performance to the South Bank in a suitably arranged space and had an innocent public to watch, it would more likely have been seen on the right terms; the environment would have invited the public to respond aesthetically. A hall in Tamworth that might be used for badminton later in the day or a pensioners’ lunch club later in the week, is bound to invite different responses even though for me, as an artist, there is absolutely no difference in my motivations and commitments. We all see what our preconceptions encourage us to see. And our politics are inextricable from our preconceptions – politics are after all in the literal sense about ‘people’. If I have a prior concern that says I’m committed to working in the arts with people of limited capacity or opportunity because that is a means to the end of dismantling a little those limits – god knows a worthy aim, surely – then that’s how my work will tend to be understood. Your misfortune (though I really think it’s your fortune: certainly it’s what makes you unique, even if it’s problematic) is to be an artist whose politics are framed by art and not primarily by your art’s social consequences, however vital they may be. Yet it seems your work is often understood as if the social consequences were the purpose. Probably this doesn’t matter when it concerns your own creations with professional artists – Triptych, Corrosion and on down the list over the years. Because the technical capacities of those you work with are so high, such performances come sufficiently clearly within the domain of what looks like art that the work, at least at that level, isn’t misunderstood. No one would think to say of Corrosion that it’s remarkable because dancer X is actually a mother of 4 children, two of whom don’t sleep at night and whose partner’s away on a 6-month contract in Bahrain, or singer Y is currently going through a crisis of religious faith and a divorce &c., because their technique – their artistry – makes such things irrelevant. But to say of the Tamworth performance that it’s remarkable because the girl was disabled is, to me as an artist, a response of this order. She obviously had no technique to overcome the expectations of her. Corrosion is judged as dance, the Tamworth work is judged as exemplary work in a field closer to therapy. And yet, if we only knew how to apply appropriate standards I don’t think such distinctions could be made. A good performance is a good performance is a good performance (and vice versa– to be measured in terms of what it says that’s not already been said, and how far it moves those who witness it. It’s really difficult for a public to have an appropriate measure for what you do through Salamanda Tandem. The range of the company’s work is so great that there can be no uniform standard by which to understand its quality. If one has certain expectations appropriate to one aspect of the work and not another and yet applies them throughout, one will misunderstand what one sees. It would like getting a plumber to repair a leaking tap and then complaining that he hasn’t stopped water coming in through the roof. It’s here that the issue is political, for ST’s performances (and I’d regard workshops as a kind of performance) begin with the potential of those participating. It’s a human choice. It’s not a choreography that says “I intend to do this”, who/what can I use to realise that end? The work begins with the who/what and its intention is to discover what is latent there already. In that respect Corrosion and Tamworth are all of an aesthetic piece. A sculptor or a potter does this all the time – drawing out that which is latent in a piece of wood or a lump of clay. In performance work one is confronted often by the expectation of a certain prior accomplishment that will allow you to express something but which, if lacking, means the performance doesn’t work (he didn’t play in tune, she didn’t move in time &c); and this is simply not always your aesthetic. Your political choice is to start with what is humanly possible in any given context and create with that. You don’t explain this – you have positively not to try – because you won’t trespass on the human potential by defining your meanings in advance. I see this as necessary to your stance, but it’s also why I think you’re ‘necessarily open to misunderstanding’. The lass in Tamworth was plainly not a dancer. How then does an innocent public recognise her dance? My answer is that she isn’t a dancer because that is not her life. But for 3 minutes in a stunningly vivid way she was permitted to become a dancer on terms that were hers and which the occasion transformed on to an aesthetic plane which couldn’t be mistaken if one knew how to look. That she ceased to be a dancer the moment she ceased to move (as your collaborators in professional work do not, because it is their life and work) says nothing about the quality of what actually happened. I think in the end an artist can only be a witness; anything else devolves sooner or later into propaganda. Post facto art becomes evidence, but that isn’t actually the work itself. If what I’ve written here looks like an attempt to summon evidence, well, maybe it is, but primarily it’s a witness to what I know of you as an artist. I hope it’s of some use to you. I hope it’s of some use to you to know that there are witnesses here in France who, knowing you exclusively as a performing artist and having no other preconceptions, recognised instinctively the direction of your work. After our concert in June one woman, as she explained to me later, was particularly moved by the final dance. She had never seen that sort of vocabulary of movement exploited in that sort of way. She recognised a skilled artist not least because she recognised elements of the material the dance transformed. But then she would – she had a preparation few have: her day work, she explained, was the administration of a centre for people with disabilities. finding these words,allowing my own to rest a while, i follow. letting images and impressions move around until they settle into meaning. there are no expressive faces for me to read here, or living persons to touch, yet i am able to listen for the voice in these words and can nearly hear their song. i imagine the artists Isabel, Tine and Jon; i imagine the space between and around them. voices unfurling, turning to one another, communicating feelings through tones. i imagine the air moving and shaping with sound. interplay of movement and stillness, the pace we give these in our minds and bodies. the qualities and feelings we bring with them when communicating or collaborating with others. all these expressions are alive with meaning when we bring this art into form. it is difficult to make this art fit in neatly with our current ways of identifying, categorising, and re-packaging for sale back to ourselves. I am not at all sure if it is even fair to try, as sometimes the process of trying to make someone and their art fit in with our preconceptions can be damaging. the stage is set for fear of failure or an overwhelming thirst for success. we already know these things; we are familiar with their effects upon us in our culture. is that why we need to fit in with and perpetuate this process, repeating it time and again, because we are so familiar with it? we may not notice the enrichment held in the art of the unknown.